Insect screen mesh. Bug Screens by Bravo. Complete fly protection. Bravo manufactures the authentic removable insect and bug screens for windows, doors and other applications. All our products are custom made to order. They are fabricated according to your sizes, so you can be sure it will fit perfectly every time! They are easy to install and provide an ideal seal around your opening. There is noo professional installation needed or tools required. In minutes, you are enjoying the benefits. An ideal use is on your as gazebo, to cover the windows and doors. Our reinforced mesh allows cool air circulation to flow freely through, yet it keeps even the smallest of critters out. 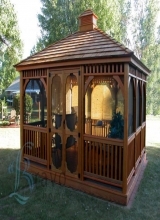 Therefore, your gazebo can be a sanctuary and a place of relaxation to allow you to enjoy the outdoors. Bravo flexible screens are easily attached to your gazebo with Velcro strapping thus ensuring it will not blow off, shrink stretch or become distorted, like traditional mesh products. Yet, they can be removed whenever you need. We use only the finest materials when constructing your products to ensure you receive the best. Bravo insect screen mesh gives you great visibility through the fabric and will not obstruct or detract from your views. We have several choices of mesh fabrics - resilient fiberglass mesh, solar UV protection mesh or pet proof screen mesh. Each provide the same 100% insect protection, but give you additional features of UV protection or pet resistant fabric if you have pet that like to jump up on your doors or windows and scratch. The pet mesh will not rip, tear or become damaged. It is virtually resistant to your pet's paws and claws. Bravo producsta re easy to clean and require little to no maintenance, as well as being affordable. They are ideal not only for your gazebo, but for your homes, apartments, offices, cars, RVs, motorhomes, boats, patios, porches, pools and so much more. They will fit any window, door or opening, even odd shaped or size openings. Try Bravo, you won't be disappointed.